The sun is farthest from Earth (aphelion) on July 5. New Moon July 8 5:54 a.m. 7:28 p.m.
Venus continues to outshine all starlike objects in the sky. It is about 25 degrees to the upper left of the sun at the beginning of the month, setting about 100 minutes after the sun. It shines in the western sky during twilight setting before twilight ends throughout the month. Venus does not set after twilight ends until September. On July 10, a waxing crescent moon joins Venus in the western sky. The pair is about 8 degrees apart. 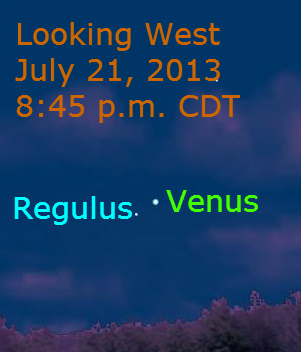 During the next two weeks, watch Venus approach and pass Regulus. On the next evening, the moon appears in the western sky again with Venus, but the two are nearly 16 degrees apart. 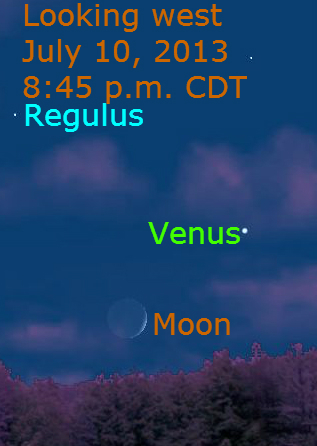 On July 21, Venus passes Regulus, the brightest star in Leo. The pair is about 1 degree apart; that’s about 2 full moon diameters. For more about Venus as an evening star, click here. July 14, the moon is 15 degrees to the lower right of Spica. July 15, Spica and the moon are about 1 degree (2 full moon diameters) apart. July 16, the moon is 4 degrees to the lower left of Saturn. July 17, the moon is 5 degrees to the left of Zubenelgenubi. 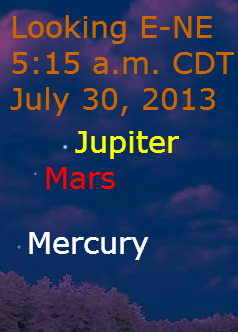 Mars, Jupiter, and Mercury are visible during predawn hours in the eastern sky. 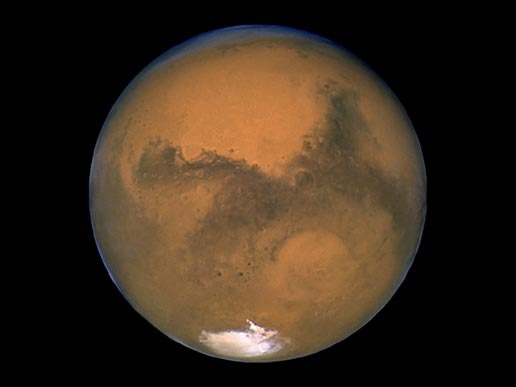 Jupiter is distinctly brighter than Mars, although Mars has a distinct ruddy color. Both are emerging from their solar conjunctions, appearing low in the eastern sky throughout the month. 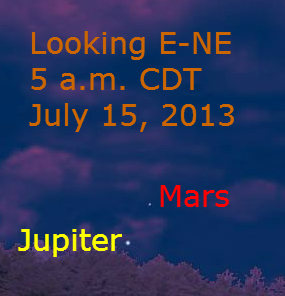 On July 15, look for Mars and Jupiter in the east-northeastern sky near the horizon. Find a location with a clear horizon. On this morning the pair is about 3 degrees apart. 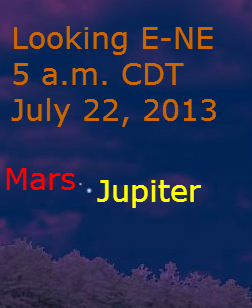 Mars’ rapid eastern orbital motion carries is close to Jupiter during the next several mornings. On July 22, the pair is about 3/4 degree apart. Mercury passes inferior conjunction (between the Earth and Sun) on July 9, rapidly moving into the morning sky. At the end of the month, Mercury appears near Mars and Jupiter. Notice how Mars has moved past Jupiter. The chart above shows the planets visible without a telescope on July 15, 2013 as ween from above the solar system. (Click the image to see it larger.) Mercury is between Earth and the sun, just past inferior conjunction. Mars and Jupiter are on the morning side of Earth with Saturn and Venus on the evening side.